GP 1GB 14 Tk 2019 Internet Offer Validity 8 Hr! 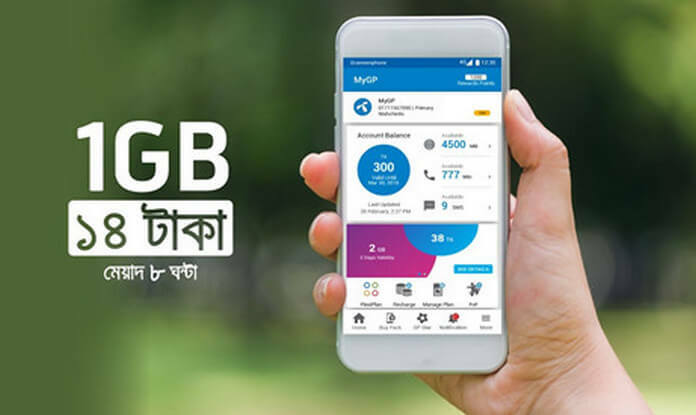 Grameenphone offers 1 GB internet at only 14 Taka, the offer will be available at Grameenphone’s MyGP App. This offer is applicable only to my GP apps, So there is no code for buying 1GB internet at 14 Taka. If you are not using Grameenphone’s My GP app, just install the app and enjoy 1GB internet at only 5 Taka. If you use the My GP app then you will get many more offers, Not just offers, you can control all the information about your SIM with this app. Stay with us to get such a new and exciting offer. If you want to know today’s offer of Grameenphone, Check This Post. Check out this article for today’s offer of Robi SIM. See the information below for details on the 1GB offer at Tk 14. This offer is applicable to all Grameenphone ‘MyGP’ App users. 14 Tk 1GB internet volume. 1GB internet validity 8 hours. The Internet package can be used in any case. Unused data will not be added to the next package. The internet package can be used in 2G, 3G and 4G network.